Burkina Faso : When and where to go? Two large seasons dominate the country’s climate: From November to May, the dry season, characterised by the harmattan, the hot Saharan wind which often makes its appearance between December and February, and the really hot weather that starts in March. The rainy season is between June and October. The best time therefore for visiting Burkina Faso is when the climate is the most temperate, between November and February despite the inconvenience of the pervasive fine sand caused by the harmattan. A relatively poor country colonised long ago, Burkina Faso is however a country rich in cultural activities and the inhabitants take great joy in their lives. This country is especially known for its cinematic festival, the Fespaco. 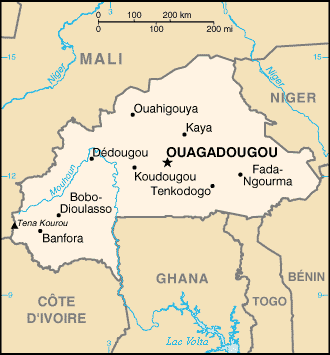 The Capital, Ouagadougou, can be easily visited on foot. That way you will get a chance to meet and chat with the inhabitants, stroll around the commercial quarter and enjoy the overall sense of welcome the town offers its visitors. To the east you will find the Arli National Park with many animals living in relative freedom; antelopes, gazelles, monkeys, elephants and lions too. To the west, around Banfora, you will find spectacular countryside, perfect for hiking or cycling. Here you can visit the Karfiguéla Falls, Lake Tengréla with its many hippopotami and the Sindou cliffs which will no doubt fill you with awe. A little to the north, in Bobo-Dioulasso you can visit the Provincial Museum of Houet with its magnificent collection of modern African Art as well as more traditional objects. Here also is the Grand Mosque representing the ethnic Bobo. Make a slight detour and visit the Kibidwe quarter with its potters and blacksmiths. In the south, the Nazinga Reserve has a wonderful elephant population and you can visit them if you are accompanied by a guide. Your travels through Burkina Faso will no doubt be enlivened by music and dance which forms an integral part of the Burkinabé culture and its traditional festivals. There are direct flights from France to Burkina Faso but you can also get there by car or train (very comfortable incidentally) from the Ivory Coast. The currency in circulation is the CFA Franc which you can obtain when you arrive there. You can also withdraw cash at distributers present in all major towns. The required budget is quite reasonable, around 20 Euros for a double room with bathroom and less than 10 Euros for a copious meal with a drink. Concerning health precautions, check your normal vaccinations are up to date and add hepatitis A, hepatitis B, yellow fever, meningitis and typhoid. Try to buy sealed bottles of drinks from manufacturers, filter or boil drinking water and avoid ice cubes. Rinse glasses before drinking from them. Use pasteurised milk and wash your hands thoroughly and regularly. You should also avoid bathing in stagnant water, do not enter into close contact with animals and protect yourself well from the sun. Travelling around the interior of the country is easy by car, bus or shared taxis. One last word of advice; whatever the type of your purchases, do not hesitate to barter over the price. This is part of the local tradition and will probably become an enjoyable part of the transaction for you too.